KS 17 "Albertina Clamshell box" with bookend support especially for incunabula and other objects with solid backs. 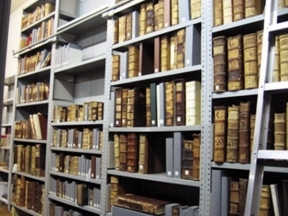 The collection belonging to the Gutenberg Museum in Mainz is diverse. The collection includes machinery and objects such as inkwells and writing equipment, medals, stamps, sculptures, cups and glasses, but also graphics and books. All these objects are meant to document the developments in printing, book and writing history up to this present time. 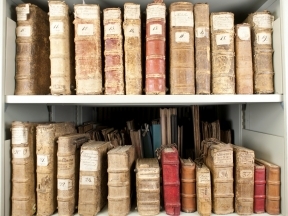 Within this rich cultural historical collection are the incunabula, which constitute a particularly important and valuable group of books printed after 1,500 but before the invention of letter press printing. Preventive preservation stops further decay and consequently averts elaborate and cost-intensive conservation measures. 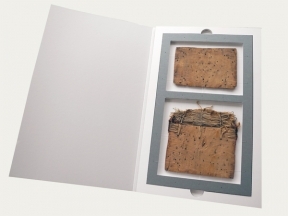 A customised preservation folder by KLUG-CONSERVATION – an ideal solution for the preservation and display of an abandoned Armenian book cover requiring protection from damage through repeated handling. 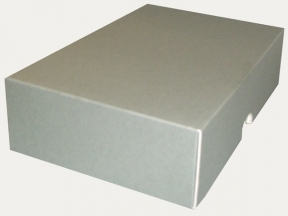 The preservation folder includes a very well designed interior and is easy to transport.